Godffrey Walusimbi defends against Egypt at AFCON 2017. Courtesy photo. 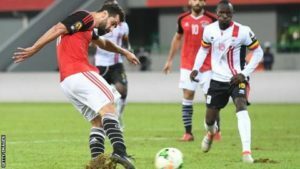 FOOTBALL–Ahead of tonight’s Group E top of the table clash between Uganda and Egypt Cranes left back Godffrey Walusimbi aka Jaaja Walu is confident Uganda will beat the odds and beat Egypt. Speaking to PML Daily about Uganda’s chances this morning, Jaaja Walu credited for reducing Egyptian star Muhamed Salah to a novice in last Thursday’s game is among the players Uganda is looking up to as Cranes battle the Pharaohs away in Egypt. “We thank God that all the players are in good shape and free from injury,” Jaaja Walu said. Godffrey Walusimbi, who is currently playing for Kenya Premier league giants Gor Mahia, is one of the longest players in the Cranes squad that travelled to Egypt having made his debut in 2007. “Tonight’s game is different from the one in Kampala because they are at home and playing under alot of pressure after that loss we inflicted on them but we are ready to do all it takes to make Uganda proud,” Jaaja Walu said. Uganda currently tops Group E with seven points having won two and drawn one of its first three games. Egypt on the other hand have an opportunity to regain top spot if they can beat Cranes tonight. They are currently one point behind Uganda. The other two teams in the group, Ghana and Congo Brazaville, play tomorrow. Ghana is third with two points while Congo Brazzavile trails the group. The Cranes team that travelled.